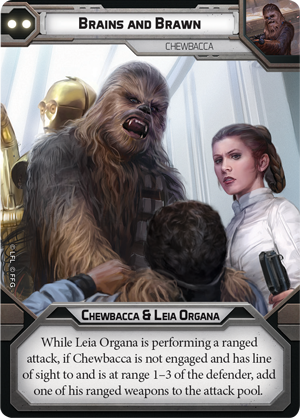 Recently Fantasy Flight Games put out the full spoilers for the new Chewbacca expansion pack. This new operative unit joins the Rebels, and is one mean customer. Prioritizing team work he’s a powerful force for good. Lets take a look. Chewie arrives with a big bang in Legion. At 110 points he’s not cheap, but he sure does pack a punch. Unlike a lot of other Rebel charterers he is not a leader, but rather a straight up brawler. With a massive 9 wounds he’s as tough as almost two whole squads of Rebel Troopers, though with only a white defense dice he can take hits easily. Still, that only makes him stronger as Enrage means eventually he’ll stop caring about morale and be able to charge into combat. I think this is a pretty cool idea, as he should start the game moving up and taking shots with his Bowcaster (a deadly weapon) before going crazy and charging into combat. Expert Climber and Unhindered are nice little buffs that make him very mobile. Guardian 3 is also nice as it lets him protect other leaders he’s working with. 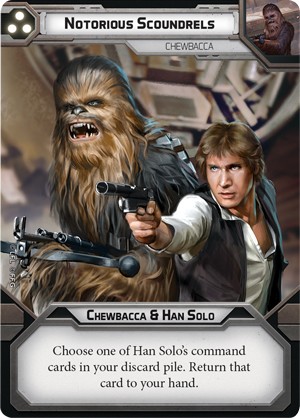 And of course he works best with old Han, as the two buddies get to extra dodge and aim tokens off of each other. 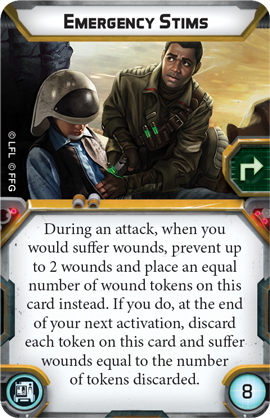 This is especially useful with Han’s 0-pip card Sorry About The Mess as it gives him both a dodge and aim token. Lastly Chewie has a very soild melee attack with 4 red dice, this is absolutely nothing to scoff at. Chewie doesn’t seem to come with any new upgrades that we haven’t seen before, but he can make good use of whats already out. Tenacity is an obvious choice for the Walking Carpet as it will bump him up to 5 red dice in combat. I’d also consider Emergency Stims, as they kind of let him count has having 11 health and can keep him going just a bit longer. Hunter is another possible choice for him. 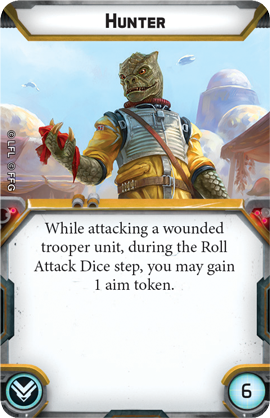 It’s not my favorite as it’s a little harder to trigger, but if you are running Han the aim token it generates counts twice so its most likely worth it. Without Han I’d probably skip it and save points. 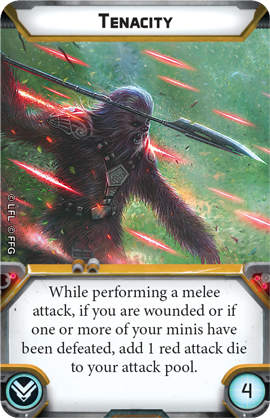 Chewie’s Command Cards are all about working with his friends, a mechanic I really like. When working with Han Chewie can use Notorious Scoundrels to get back one of Han’s command cards. I’m a little on the fence about this one to be honest. Han’s cards are good, but this is in-effect losing losing any special ability this turn to get back a Han card later. It 1000% better than taking the basic Assault card, so I’d run it if Han was my only commander, but if I have Luke or Leia around as well I’d most likely take their 3 pip card instead. 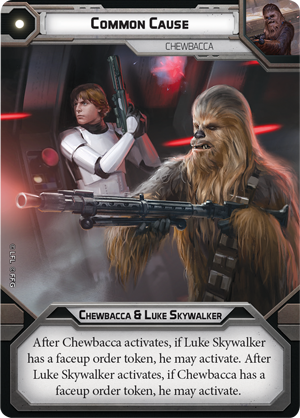 Lastly Chewie’s friendship power with Luke is Common Cause, this one pip cards lets the two activate right after each other. This is a pretty great offensive card, as it’s got a decent chance of letting you activate two powerful characters before the enemy gets to go at all. Though the artwork on the card show them shooting, its clear this card is best used to launch a devastating charge. Together Luke and Chewie can charge into the enemy ranks and really beat them up in melee. You can then uses Chewie’s Guardian ablity to keep Luke alive so he can follow up next turn with Son of Skywalker. It’s a powerful combo. 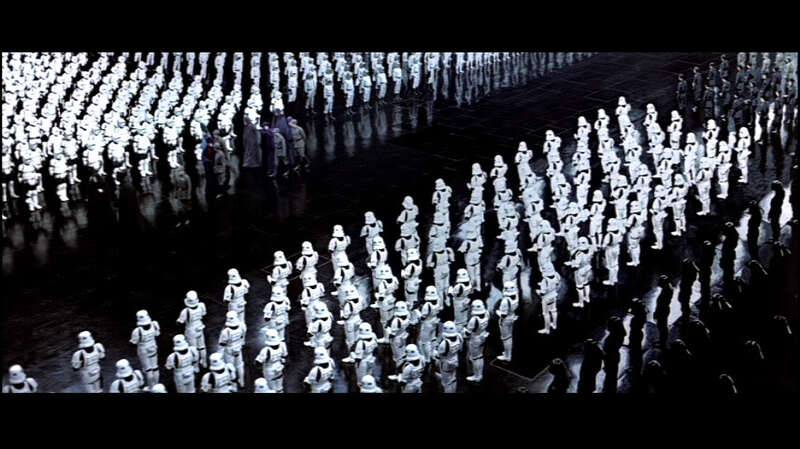 Moreover I think with a addition of a few of the new Wookiee Warrior units the Rebel’s can now field a pretty powerful melee army. Let us know what you think about Chewbacca down in the comments!